The Parish Office will be closed on Good Friday (April 19th) and Easter Monday (April 22nd). We will resume our normal business hours (M-F 11am-4pm) on Tuesday April 23rd at 11 am. The people of St. Augustine and Sacred Heart have been very generous to the Totus Tuus program. Many people have already stepped up to volunteer their time and many others have given their treasure in support of the program. However, we still need more volunteers to make Totus Tuus successful. -We need two more people to round out the team that will plan the Friday Fun Afternoon on June 28th. This is an exciting afternoon filled with water games and races and is one of the highlights of the week for the children. -We also need two or more people to coordinate the parish wide brunch for Sunday June 23rd. 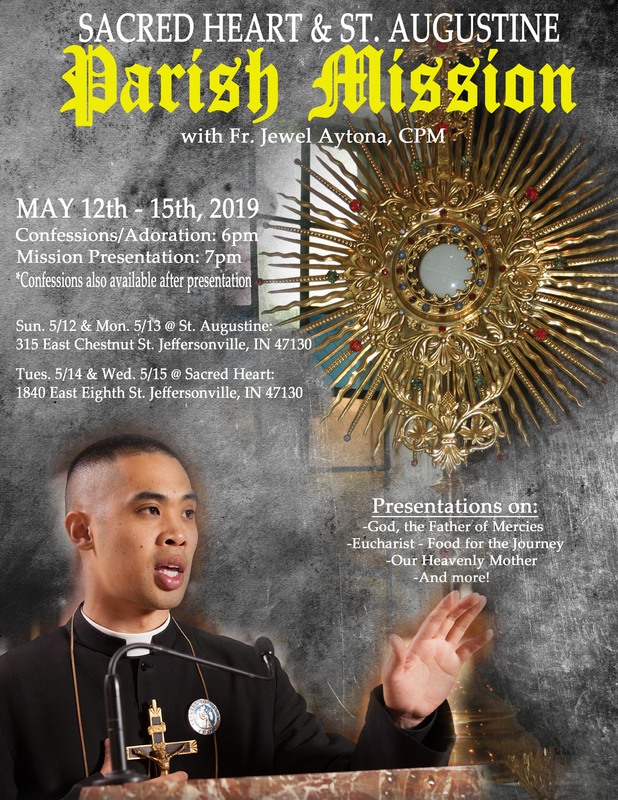 This will be a great opportunity for the whole parish to learn more about Totus Tuus and get to know the young men and women who will be teaching our youth during the week long program. -We still need more adults/parents to be daytime classroom volunteers and/or evening chaperones. Having our own parishioners in the classrooms ensures the safety of everyone in the program. St. Augustine and Sacred Heart are very blessed to be able to offer the Totus Tuus Program to our youth. Come and be a part of something wonderful! Come and watch the Holy Spirit at work among us! With the season of Lent coming to a close later this month, this is a good time to update the parishes on the Young Adult Initiative and our local young adult ministry called Y’ALL. The Young Adult Initiative is a grant program funded by the Lilly Foundation in Indianapolis whose goal is to find best practices and programming tactics as well as to discover and address the reasons why more and more young people (18-39) are leaving the church building. This is not an exclusively Catholic problem. Our parish is part of the St. Meinrad innovation hub along with 14 other catholic parishes from 5 states. Funds from this grant will be utilized to enhance our young adult ministry. This leads us to our young adult ministry here at Most Sacred Heart of Jesus and St. Augustine parishes. Y’ALL started as a high school ministry program in which most of the participants were young adults as opposed to the target demographic of high schoolers. During Lent 2017, Y’ALL stood for Young Adults Learnin’ Lent and was led by Deacon Vinny Gilmore. After Lent was over, we wanted to continue to meet and learn and grow together, so here we are. Young Adults Learnin’ Life. Y’ALL meets almost every Wednesday in the Parish Hall at St. Augustine or when the weather is really nice we meet on the Parish Office front porch. Our gatherings begin at 7:00pm, but don’t worry if you’re running late or have to leave early. The door is open. Recently, the programming shift has changed to a monthly theme with one “major” event which will occur each month. We are looking at hosting bible studies such as “The Bible Timeline” by Jeff Cavins. More details to come on things like that in the future. Some of our events will be open to the whole parish community. We really would love for you to join us. April 18th- Holy Thursday Church Pilgrimage with Louisville Young Catholics’ Christ in the City Group. More information forthcoming, the “official” first stop is St. Louis Bertrand in Louisville. April 24th- Fr. David Carr from St. Martin of Tours in Louisville will be presenting on Prayer and working prayer into daily life. 7:00pm in the St. Augustine Parish Hall. Have a Blessed Holy Week and Easter Season. The Prayer Warriors would like to extend an invitation to you that you would join them for prayer at 4 pm on Sundays in Sacred Heart's Blessed Sacrament Chapel. The group will not be meeting on Easter (April 21st), Divine Mercy Sunday (April 28th), Mother's Day (May 12th) or Memorial Day Weekend (May 26th). This April 28th is Divine Mercy Sunday. 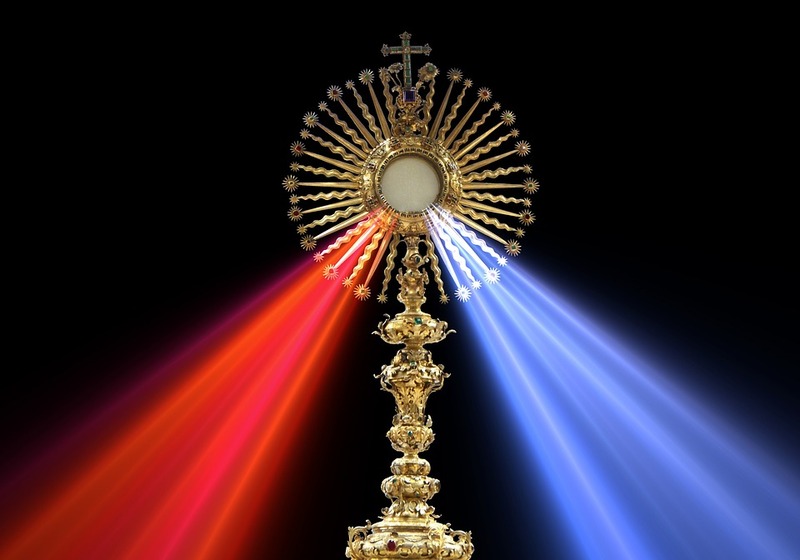 St. Augustine will be hosting an hour of adoration at 2:00 pm that afternoon during which the Divine Mercy chaplet will be recited to commemorate the apparition of Jesus to St. Faustina, a Polish nun and mystic. Please join us at 2:00 pm at Saint Augustine's Church on April 28th for this special occasion. On April 28th at 4:30pm at Saint Augustine's Church, our Director of Music and Liturgy, Dan Reid, will be giving a voice recital of "Songs of Love and Loss." This recital features works of Mozart, Schubert, and Alan Menken and is free and open to the public. A good will offering will be encouraged, and all proceeds will go toward the music and liturgy programs for our parishes. What is the National Catholic Youth Conference? The National Catholic Youth Conference (NCYC) is an exciting, biennial three-day experience of prayer, community, and empowerment for Catholic teenagers and their adult chaperones. The schedule includes general sessions and workshops addressing a wide variety of topics as well as opportunities for reconciliation, daily liturgy, and special activities such as concerts, a dance, and comedy club. The thematic village is a unique venue incorporating traditional exhibits with interactive educational and recreational activities. We are going to have an informational session for anyone who is interested in attending or chaperoning NCYC on Wednesday April 24th at 630 pm in the youth room above the gym at Sacred Heart. NCYC is open to all students who will be in high school at the time of the conference. I look forward to seeing you there at the meeting, if you have any questions in the meantime please contact me. The National Catholic Youth conference will be November 21st-23rd. I encourage anyone who will be in high school beginning in the fall of 2019 to attend. We will be taking a group from Sacred Heart and St. Augustine parishes. While there is a cost to attending the conference we will have several fundraising opportunities to assist with the cost of the trip. I have a few students who have reached out already and now is the time to start planning. I am looking for chaperones. NCYC can be a moving and wonderful experience for our adult leaders, as well as our students. Please do not miss out on this life changing event. Contact me for more information via email. 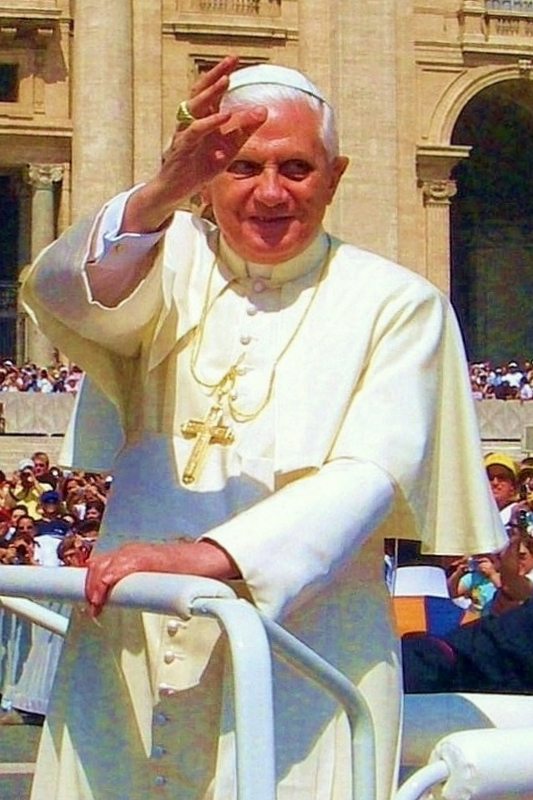 Pope Benedict XVI recently wrote about the clergy sexual abuse crisis. You can read the full text by clicking here. Registration begins March 31, 2019. Find the registration form here.